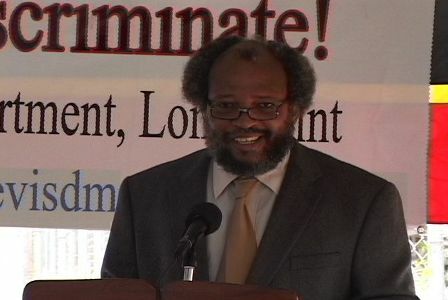 (file photo) Director of the Nevis Disaster Management Department Mr. Lester Blackett. CHARLESTOWN NEVIS (September 3, 2010) — Members of the Nevis Disaster Management Department, last week, met with Executive Director of the Caribbean Disaster Emergency Management Agency [CDEMA] Mr. Jeremy Collymore and the National Disaster Coordinator for St. Kitts-Nevis, Mr. Carl Herbert to discuss advances in disaster management and preparedness on Nevis. While on Nevis, Collymore emphasized CDEMA’s regional institutional support with a number of meetings including one with Permanent Secretary in the Premier’s Ministry Ms. Angelica Elliott. Among issues discussed were disaster risk reduction initiatives for the tourism sector, greater collaboration and integration between local and regional entities as well as strategies specific to the island of Nevis. sector and indicated the need for CDEMA to address evolving issues in relation to multi-state countries and the country project selection process. Meanwhile, residents of Nevis can expect improvements in disaster management as Collymore underscored his agency’s commitment to improving disaster risk reduction strategies. In a meeting with the technical staff at the Nevis Disaster Management Department, Collymore discussed programming development with focus on the 2010-2011 period, the mainstreaming of disaster management at all levels and CDEMA’s support of upcoming activities. He indicated that special focus will be placed on school based education programmes, the adaptation of a Caribbean Disaster Management strategy for St. Kitts-Nevis and the development of a new disaster plan for Nevis which is to be incorporated into a new disaster plan for the Federation. Tours of the Wind Farm at Madden’s Estate and the West Indies Power Geothermal Facilities formed part of Collymore’s trip as he received an appreciation of Nevis’ renewable alternative energy initiatives.